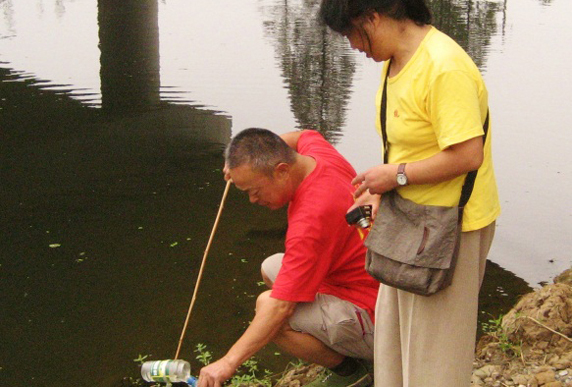 Mao Ge Uses the Power of Social Media to Fight Water Pollution in China. Mao Ge was walking along the Xiangtan River near his home of Xiangtan, Hunan Province, when he noticed thick red sewage streaming into the river from a nearby chemical plant. He quickly whipped out his cell phone and snapped a picture of the chemical assault on his town’s water supply. Then he uploaded it to Weibo-China’s Twitter- where it was immediately re-tweeted 4,000 times with 2,000 personal replies. Local news outlets quickly picked up on the flurry of social media activity. Reporters wrote several stories about people’s passionate response to Brother Mao’s tweet and about the polluters responsible for dumping toxic waste into the Xiang River. The public outcry soon prompted an investigation by Xiangtan’s local Environmental Protection Bureau, which shut down the polluting factory, followed by an unprecedented public apology from the company chairman. Mao Ge is a leader in the Xiangtan Environmental Volunteers Association, which is a core member of the “Mother Xiang River Network,” created by Green Hunan, an environmental group fighting water pollution in Hunan Province. Green Hunan recruits ordinary citizens to become active watchdogs and trains them to identify water pollution, take samples, and use modern mapping technology and social media to force polluters to clean up their act. Can you imagine? That a photo and a tweet would be so powerful! Photo of red sewage discharge that led to the shut down the factory responsible. 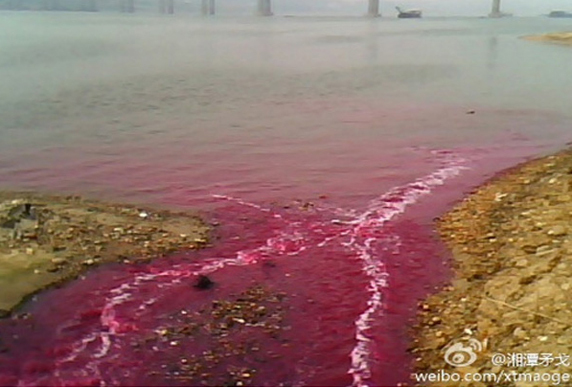 In China, over 70 percent of lakes and rivers are polluted and pollution accidents happen almost daily. Pacific Environment works with a robust network of community-based environmental groups to address the country’s water pollution crisis. We provide grants, programmatic guidance, and technical support to help grassroots activists grow struggling volunteer and student groups into professional organizations that win major environmental victories. Once a year in September, we host an annual coalition meeting. This year we brought together 15 partner groups in the city of Hangzhou on China’s central coast to amplify the impact of our water pollution work. During a water monitoring field trip around Hangzhou, our partners tested innovative data collection technologies that will help them increase people power on the ground by engaging ordinary citizens in grassroots activism. Using smart phones, participants learned to enter pollution data directly onto an online water pollution map and tested Crowdmap, an online platform for simple data and map sharing. With more and more water monitoring techniques becoming easily accessible to ordinary citizens, many of our partners are stepping up their efforts to adopt our successful volunteer network model. They are reaching out to local volunteer associations, college student groups, and neighbors to help them monitor local water pollution, focus media attention on polluters, and work with local government regulators to curb water pollution and hold polluters accountable for the damage they cause. The bigger the network, the greater the chance that one day every Chinese citizen will be able to enjoy clean and healthy rivers. This victory and the growth of citizen water monitoring networks is made possible by Pacific Environment’s direct financial and technical support of our grassroots partners in China.